Just when firemen thought they might have a breather Wednesday morning, the alarms went off again in the afternoon. This time it was back toward Adamsville, up Hwy 281 about 8-1/2 miles to the area of the Underwood ranch and the Jim Eddy ranch. There it seems 4 fires along the highway were blazing. The wind eventually brought them all together into one 262 acre fire. It was a fierce firefight, with Fire Chief Reece Oestrich calling for mutual aid from other fire departments. Adamsville units came quickly and were joined by Lometa, Kempner, Copperas Cove, Burnet and Oakalla fire units. County Commissioner maintainers came in to help, as well as State Forest Service dozers and special state Air Command spotters. A special fire team that was working on the Harmon Fire came in to help, and even a local business, Agro-Tech, came in with water tanks to refill fire tankers. We talked with Chief Oestrich this morning as he and a crew were out checking fire lines this morning. The fire involved some 262 acres altogether, and is declared fully controlled and for all practical purposes - out. As to what started the fires along Hwy 281, they don’t know but there was certainly a coincidence. The Chief said it could have been a truck tire problem, a dragging chain or one of a number of things. 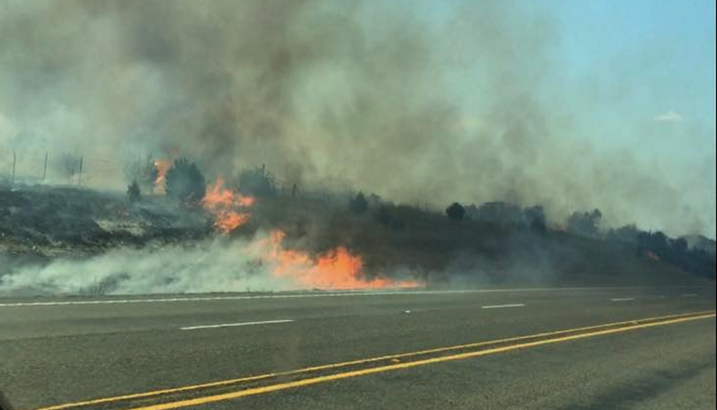 The fire was big enough that Hwy 281 was shut down for a time. No homes or barns were damaged, though apparently one shed of some sort in a pasture was burned up. We can all be thankful, and proud, of the successful work our area firemen are providing during this stressful time in Central Texas. Oh yeah! In another interesting note, Chief Oestreich told us that apparently another small fire broke out on 281 by the airport. He said that passerby motorists seemed to have stopped and joined in to stomp out the fire…and they did! Fort Hood’s Range Fires continue to be a problem with no easy solution. Grass fires were first spotted flaring up in the installation’s impact area July 17. Since then, separate fires in that training area grew to about 8,500 acres. As of last report, they say it is still not under control. “We are carefully managing risk from this fire to reduce any possible impacts to our neighboring communities,” III Corps and Deputy Base Commander Maj. Gen. Kenneth Kamper said Tuesday. Due to their isolated location, the fires within Fort Hood’s training area pose no immediate risk of leaving the post boundary, and they aren’t an immediate threat to life or property. Firefighting efforts were augmented, initially, by the Texas State Forestry Service providing water and fire retardant drops, though TSFS assistance left the installation over the weekend to tackle other fires in the state. That brought more military units in with helicopters and bulldozers to take up the fight and they’ve been working on widening firebreaks, and dropping water from Bambi Buckets onto hot spots within the impact area.